We asked Mr Green, the winner of our 2014 Photo of the Year competition, to share with us the story of how he captured the winning image of his Yak of the Year, perfectly positioned in front of Ama Dablam in the Everest region of Nepal. "It is the 11th day of our Everest Base Camp & Gokyo Lakes trek and our group had earlier arrived at Dzong La, after a relatively easy walk up from Lobuche. Dzong La lies at an altitude of 4850m which is around the same as the summit of Mont Blanc. We ate a hearty alfresco lunch at 4850m in blazing warm sunshine at the inappropriately named Green Valley Hotel - also our accommodation for the night - and spent the remainder of the afternoon relaxing, reading and drinking tea whilst also drinking in the amazing views of Ama Dablam spread out in front of us. My attention was grabbed by a really massive and handsome looking Yak lumbering in to the view over the brow of the hill and I rushed off to fetch my camera. 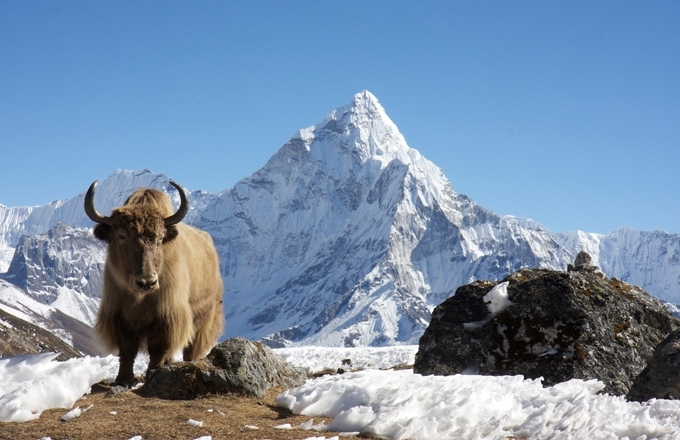 Instinctively I knew that if I managed to find a position in which I could juxtapose this magnificent Yak in the foreground against the clear late afternoon views of Ama Dablam that I would have a great image. Little did I know that it would take me around 15 minutes from first to last in a series of photographs and a fair amount of running around in the thin air trying to get both myself and the Yak in exactly the right position in order to compose and capture the image that I saw in my mind's eye. Once I was happy with everything, I squeezed the shutter button for the final time and was happy that I had bagged a great image. For the photographically minded I used an old, somewhat battered Canon EOS 40D mounted with a dusty EFS 17-55 f2.8 lens. The exposure was made as RAW file, using aperture priority set at f16 to ensure that both foreground and background remained in focus."